Tom is quoting from a talk by new DTO CEO Paul Shetler at a CEDA conference on Digital Government. We mentioned Paul in our July article Advance australia.gov.au: Our Own GDS brawl?, That article talked about the challenges Paul faced in trying to introduce the UK’s Government Digital Service (GDS) model in Australia, in light Australian Government funding cuts and the lack of progress on previous eGovernment initiatives (we were quoting from another Tom Burton article in The Mandarin.) The UK Government Digital Service has had a working rule of getting services to full public level within 20 weeks. In Canberra the aim is to have the first projects ready for beta release with 20 weeks. Is that realistic? In his talk at the at the CEDA conference, Paul Shetler gives details of the approach, saying that their research confirmed that more than 50% of the 2.5 million users who access government services each month said they experienced a problem. 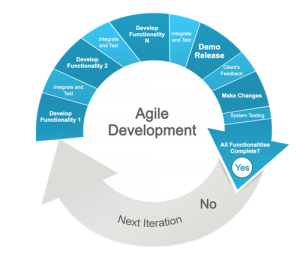 The DTO’s agile approach aims at fast tracking projects, with early delivery of working systems. The first DTO project is a new portal for accessing government services, gov.au. A prototype is being built designed around common user needs and will be ready in nine weeks time. The DTO’s four part development approach comprises: discovery, alpha release for review, beta release for further review and then ongoing development and iteration once the service has been fully released. The Department of Industry, Innovation and Science and the Australian Tax Office to build a new business registration system. The Department of Immigration and Border Protection to improve processes for Australian businesses engaged in international trade. The Department of Human Services to transform the way approximately 600,000 citizens register for Medicare each year, under the Digital Transformation Agenda. The ACT government, to build a new system for non-urgent medical assistance. See DTO: gov.au to be new entry portal for government services for further details. Dean outlines an agile manifesto for government, or a Lean start-up approach to government services and goes on to identify Agile success factors and to give some further tips for success in large organisations.